After reading The Magic Mala, the majority of readers want to buy themselves some mala beads but don’t know where to get one. So I created a page with some retailers that I think you’ll love. Check that list out on the Malas page. Let the mala choose you, meaning: Are you attracted to the beads (the gemstones, wood or seeds)? If you are drawn to the color or appearance of the beads, then your body and subconscious mind are telling you that these beads are perfect for you. Decide on knotted or not-knotted. The better quality malas are knotted, which means that there is a knot between each bead. Why is this helpful? If your mala ever breaks with a knotted mala, the beads don’t all fall off the string–only one or two fall off. Trust me, when half or more of the 108 beads fall off your string, beads go everywhere! And you are more likely to lose some.Having said this, knotted malas are typically a lot more expensive, because it takes a lot longer to make a mala when knotting 108-plus beads. And malas that are strung with nylon cording, as opposed to cotton or silk, are nearly unbreakable. So you save a bunch of money AND there’s little chance your mala will break anyway (as long as you’re not rough with it). In the end, it’s a matter of finances and preference. Personally, I think you’re good either way, so don’t stress out on it. Get the mala that appeals to you most and then look to see if it’s knotted or not. If not, see if it’s strung with nylon cord. Then make your choice. If you don’t feel drawn toward any one color or gemstone (material), decide the cerebral way. Do a search online for chakra colors, and choose the color that is associated with whatever chakra you resonate with the most. Then find a mala that has that color in its beads. Don’t make this more complicated than it is. Keep it simple. If someone gives you a mala, use that one. If the only mala you can afford is made of seed or wood, go with that. It’s really more about the practice of using your mala than it is the material of the beads–especially when you get started. So keep it simple and joyful, which is what working with a mala is all about. It’s called flow, flowing with the current of life as opposed to swimming upstream. 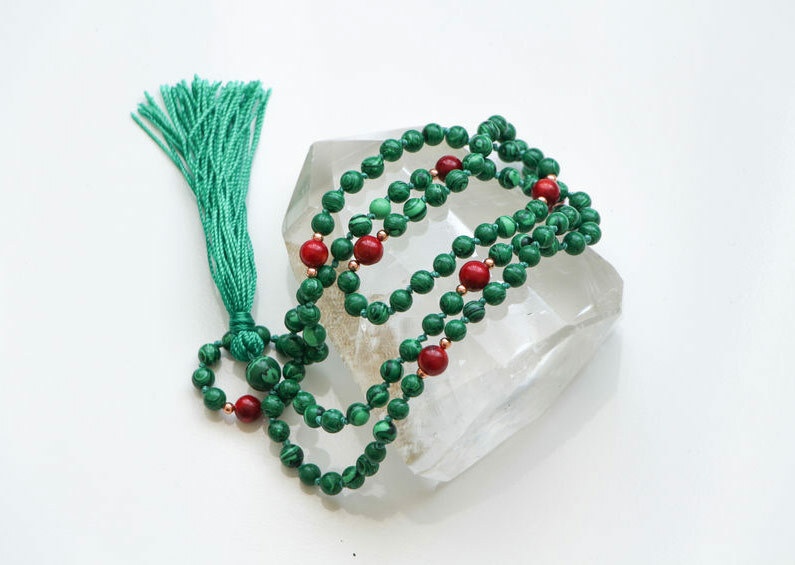 PS, Don’t forget to visit the Malas page to find mala bead retailers. https://bobolson.com/wp-content/uploads/2017/03/malabeads2.jpg 565 795 Bob Olson https://bobolson.com/wp-content/uploads/2017/03/Bob-Olson_logo-1-300x110.png Bob Olson2017-04-19 12:48:052017-05-01 09:02:30How To Choose Your Mala Beads!